It's been busy as usual around here lately. I've been working on projects for Maddy's first birthday party and taking care of my kiddos. Claire had a couple nights of staying up late and I don't know about you but when my kids are tired they turn into little monsters. Matt signed me up to run in a race with him in a few months. It's only three miles but considering the fact I don't run at all right now it could be a bit of a challenge. I need to find the time to start running. Or just stop being lazy, I could use the exercise. Ok, enough about exercise...let's talk about cookies. I'm more familiar with that subject. 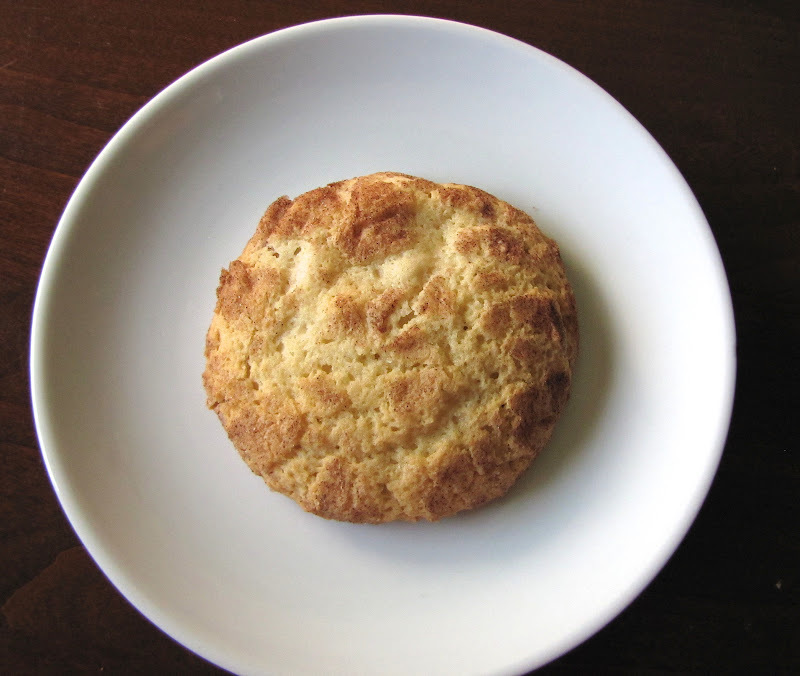 Matt found a recipe for these cream cheese filled snickerdoodles last week and asked me to make them for him. I'm a chocolate lover myself but can be persuaded to make something different every once in a while. And to my surprise they turned out quite delicious! I had planned to snap a picture of the inside so you could see the cream cheese filling but I waited until the last minute to get photos and had left this one (the last cookie) for a brief moment to take care of a minor crises and by the time I got back it was gone. I'm not naming any names here but I think there is a cookie monster in my house. It could possibly be the same tired monster I mentioned earlier. Here is the recipe. Make the cream cheese filling by mixing the cream cheese, 1/4 cup sugar and 2 tsp vanilla. Cover the cream cheese mixture and refrigerate for at least 30 minutes. Cream butter and 1 1/2 cups sugar until fluffy. Add eggs and 1 tsp vanilla. Mix until combined. On a low speed mix in your flour, cream of tartar, baking soda and salt. Set dough to the side. In a small bowl combine remaining 1/4 cup sugar and 2 tsp cinnamon, set that aside as well. Remove the cream cheese mixture from the refrigerator. Place 1 tsp of the cream cheese mixture on top of one of the flattened dough disks. Then place the other flattened dough on top of the cream cheese. Pinch the edges together to seal. Carefully form into a ball and roll in the cinnamon sugar mixture. Place on a plate as you finish making each and refrigerate. Before baking the cookies they should chill for 15 minutes. When the dough is chilled bake on a parchment lined baking sheet 2" apart for 8 minutes.